I haven’t posted to my blog in months. I was feeling a lot of guilt about it. I got overwhelmed because I didn’t share ALL the things I made for Israel. I didn’t share the quilt I finished or the HUGE top that’s going to go on our bed. I may share them eventually, but I realized…this is my blog. I don’t have to post. No one is going to die if I don’t and I don’t have to detail EVERY single project I do. I don’t even have to post about crafty things. AND after having been prompted by a dear friend, (Ok, she may have been laughing at me) I decided that I should, in fact, come back to my blog with the following statement. …that breaks my heart a little. Please forgive the bad lighting, cuffed jeans and occasional doggie ear. I took these in my bathroom an hour ago because I was so moved to write this post. Now, don’t get me wrong. Y’all know I’m a good southerner and I love my Rainbows. To me, these don’t count as sensible. They’re simply an extension of my foot and you can find me in them from the VERY first possible day in the spring until I can’t stand the cold toes anymore in the fall. But really? 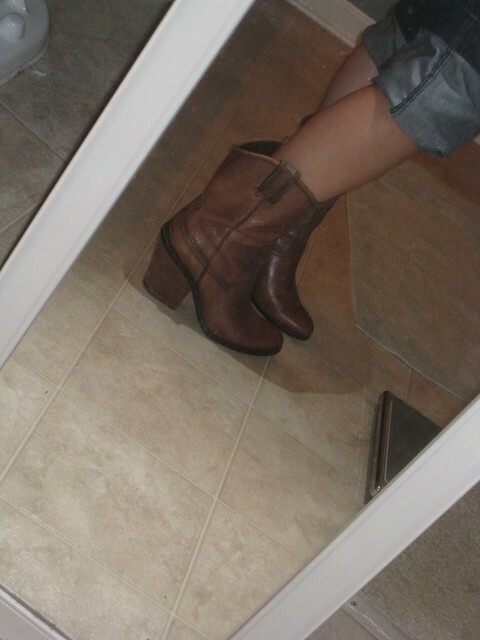 Even my cowboy boots have heels. Here’s the thing. In my new job, I’m not just a teacher, though I do spend a lot of time teaching. I’m the “Youth Programs Director,” and that means I need to be dressed up. AND (being a good southerner) I know that you can’t wear a nice dress without heels. When I say “heels,” I don’t mean an inch or two. Much like my Jewish sista, Sarah Jessica Parker, I want them STUPID high. I’m a fan of the 4 inch+ models. Being that I’m all of 5 feet tall (if you’re generous and I’m stretching), I started with the sky-high heels when I was LITTLE. IN HEELS, I can walk up and down stairs with a book on my head, I can dance backwards, I can walk like a lady and throw a good punch if need be. I also feel strongly that if you can’t walk in ’em, you don’t deserve ’em, but that’s a whole different post in and of itself. Last year's Rosh Hashanah shoes. Suede, almond toe, 5 inch spike. YUM. Here’s my problem. The High Holidays are coming up and I know I’m going to be on my feet for 10+ hours a day for 3 days. I’ll be working with kids, running from place to place (sometimes through grass) and in and out of services. I know I should wear comfortable ::shudder:: shoes. So, I’ve been looking. I went to a bazillion stores. I tried on a bazillion shoes. I combed Zappos and Endless and all the rest. I couldn’t find what I wanted. I looked for wedges. I looked for pumps. I looked for platforms. Then I found them. Steven Madden. Royal Blue. Chunky [read: sensible!] Heel. Peep Toe. STUNNING. They came this afternoon. I'm in love. 5 inches (with a 1.5 inch platform, so really only 3.5 inches) I’m a glutton for punishment and a good pedicure…I can’t help myself. This entry was posted in General Happiness, Holidays, Uncategorized and tagged shoes. Bookmark the permalink. Sigh. I swear that we’re telepathically connected sometimes. I was running around not one, not two, but THREE stores last night frantically looking for shoes that would be not only sensible for lots of time spent on my feet and having to dash around, but also fashionable to be worn backstage at Fashion Week events. I’m still on the search for shoes for the runway shows, but decided that dressy flats with a fashionable dress for Fashion’s Night Out was the way to go. I’ve been paranoid that my footwear isn’t ‘up to snuff’ all day. Flats don’t equal “being fashionable” in my book. Sky-high heels do! Hi Joanna, It’s all my fault, you know. If I hadn’t been such a stickler on my girls walking properly in any heel, this may have never happened to you…sigh, sob, laugh!!! Enjoy, and don’t for get to treat the suede…you will be running through the grass! Love you! Yay, how wonderful to see a new post from you show up in my Google Reader! I know, life gets busy. You don’t always have to have a crafty project to do a post, you know. I give you a lot of credit for wearing all those heels. 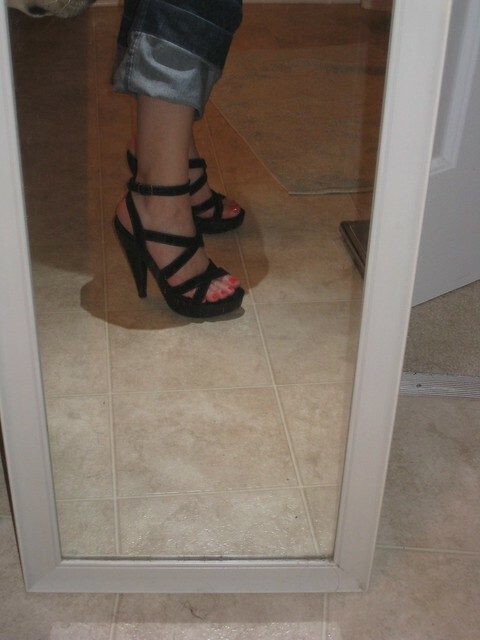 When I was in my 20s, and even 30s, I used to wear more heels. 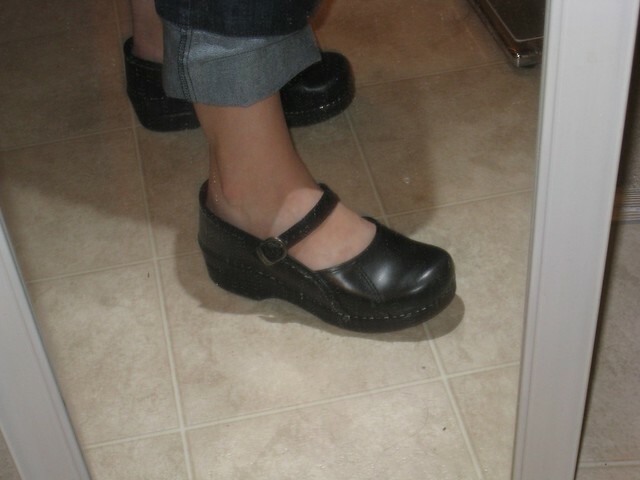 Now, I love being able to wear my Chucks to work, and sensible flats or boots with a small (2.5 inch) heel. You’re rocking the heels, for sure!